Easter Ross farmer Donald Ross is to embark on a technology make-over after winning the AgriScot Scottish Arable Farm of the Year 2018 award. 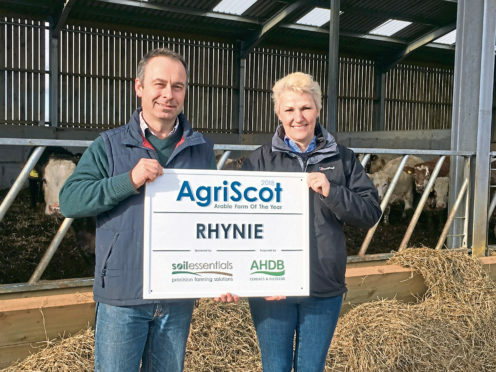 As well as an official farm sign from sponsors SoilEssentials, Mr Ross also qualified for a precision package from the Brechin-based company, specially designed for his Rhynie Farm enterprise. This involved a presentation and setting-up visit to the farm by SoilEssentials’ agronomy manager Alison Easson, who explained what the package can deliver. Preparations included submitting field boundaries and assigning satellite imagery to facilitate crop analysis and better informed decision-making, all accessible through SoilEssentials’ cloud platform KORE. Mr Ross also has the ability, through the package, to upload drone imagery captured throughout the growing season to view, monitor and manage crops. “I’m excited to be on this new path and really looking forward to what the KORE platform allows me to do,” he said. His entry was commended by judges for its understanding of costs, passion for collaboration, zeal for soil health and drive to improve the business. Having not visited AgriScot for many years until last December, Mr Ross said he was amazed at how the event had grown and what it now offered. “I had a very enjoyable day, not only because I was a winner but also because I was able to network and make many new contacts,” he said. “Living and working in a remote area can, on occasions, feel like you’re operating away from the beating heart and existing under the radar. Mr Ross is also a member of the AHDB Black Isle Arable Business Group which won second place for wheat yield potential at last November’s Yield Enhancement Network event in Harrogate.